Hi everyone! I hope you are all having a lovely week so far. 10 DAYS AWAY! In case you can't tell, I'm pumped. Even though it will most likely still be in the high 80s here in Texas, you can bet that I will be planning for Halloween, lighting all of my pumpkin candles, and rocking dark lipsticks. 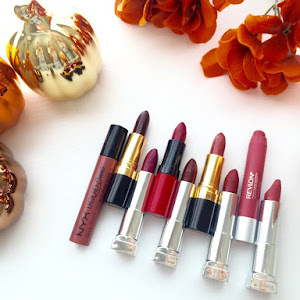 Speaking of lipsticks and fall time, in this post I am so excited to share with you all my absolute favorite drugstore lipsticks for the upcoming season. I am a bit of a lipstick hoarder, so it was hard to narrow down my favorites to just a few. So, even though a lot of these shades are pretty similar and in the same color family, different formulas make them stand out. I swear even the most similar ones hold slightly different tones (which totally justifies why I purchased them in my head). 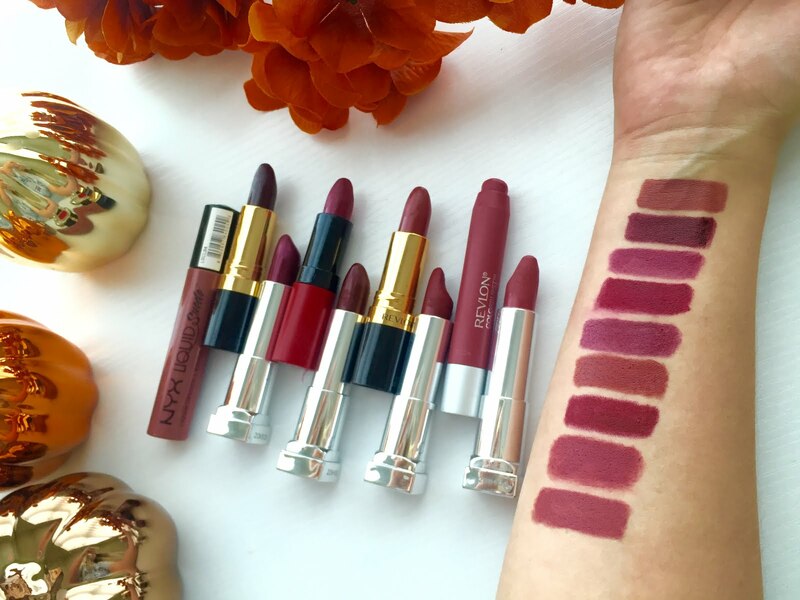 My favorite shades to wear during the fall season are mauves, dark berry tones, and dark reds. 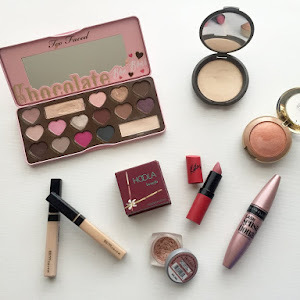 I compiled 9 of my favorites that I wear constantly together here for you so that you can prepare your makeup collection for the upcoming season. 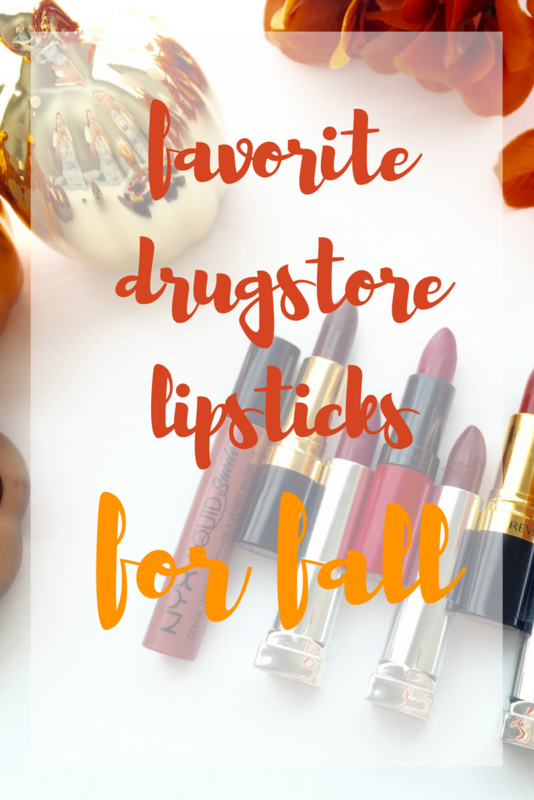 So, without further ado, here are my favorite drugstore lipsticks for fall! 1. NYX Liquid Suede Cream Lipstick in "Soft-Spoken"
I think that this is such a flattering brownish-mauve, natural, your-lips-but-better color for fall. The formula is similar to that of a liquid lipstick: it's matte, long lasting, dries smooth, and a thin layer is all you need. It's pigmented and applies evenly. The only thing is, as with all liquid lipsticks I have personally come across, is that it can be a tiny bit drying. However, just apply a lip balm before you use it and you're good to go! If you're someone who is a bit hesitant to try out a dark bold lip for fall, I think a color like this is a great way to add a warm fall vibe to your makeup look without going too crazy. 2. Revlon Super Lustrous Lipstick in "Black Cherry"
Taking it to the opposite end of the spectrum color wise, this gorgeous bold shade is a much loved lipstick of mine for fall. It is a very deep, cherry toned shade that is just stunning. It's a creme finish, so it's not matte, but it's also not super glossy. It wears very comfortably on the lips. I recommend a lip liner with a shade this dark so it won't get everywhere, because it can smear easily. I just think it's so striking and perfect for a vampy fall makeup look. Out of all of these lipsticks, I receive the most compliments when I wear this one. 3. Maybelline Color Sensational Lipcolor in "Blissful Berry"
This is a fairly recent addition to my collection. 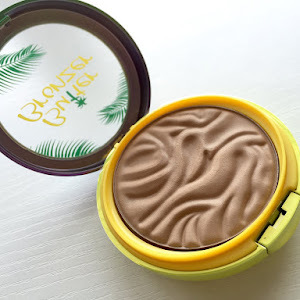 I talked about it in my August favorites post which I will link here in case you want to check it out. This is a new shade to the Maybelline Color Sensational line, so when I saw it in store I just had to have it. It is a beautiful purpley-pink toned berry shade that's a big brighter than the other lipstick shades I am talking about on here, so it's a great summer-fall transitional shade. The formula is great: it's super creamy, pigmented, and goes on easily. It finishes with a very slight shine. 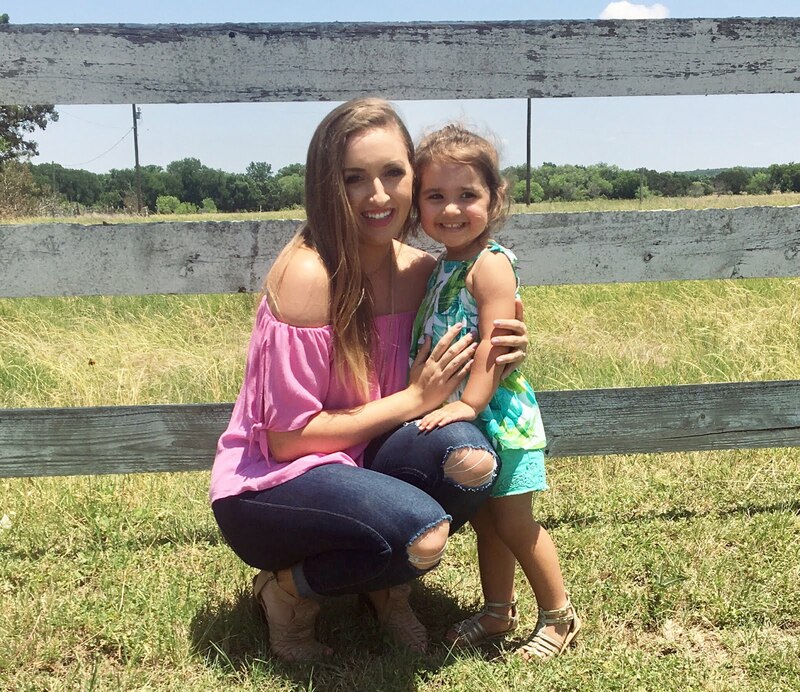 This lipstick actually made it into my holy grail makeup products post from awhile back because the formula is the best formula I have come across so far in a drugstore lipstick. 107 is an incredible deep red shade that is perfect for the fall and winter. The formula is lovely. It goes on ridiculously smoothly and makes you feel as though you are wearing a light lip balm instead of a pigmented lipstick. It lasts all day and has the most comfortable matte finish that I have ever come across. 5. Maybelline Color Sensational Lipcolor in "Deepest Cherry"
This is another new shade to the Maybelline Color Sensational line. It has the same formula as lipstick #3 on this list. This shade is another berry shade that has a bit deeper, more cherry of a tone compared to "Blissful Berry", though it definitely still is more purple/pink toned than #4 on this list. 6. Revlon Super Lustrous Lipstick in "Rum Raisin"
spice sort of tone that makes me think of cinnamon. Once again, the finish is a creme so it has a bit of a shine to it, and it's moisturizing and comfortable to wear on the lips. 7. Maybelline Color Sensational Creamy Matte Lipcolor in "Divine Wine"
This was a Pinterest find for me. 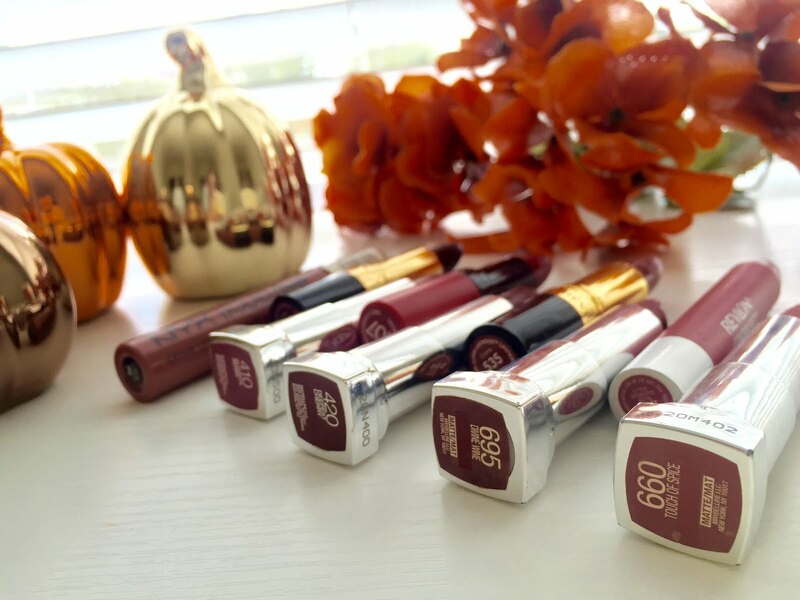 True to its name, this is a deep, wine toned shade that just so perfect for fall. I think this color can be flattering on so many different skin tones which is great. This dries completely matte, but can be a bit drying after a while, so be sure to apply lip balm underneath it. When swatched, it's pretty similar to lipstick #4 on this list, though it has a more berry/maroon tone to it, whereas lipstick #4 is more red toned. 8. Revlon ColorBurst Matte Balm in "Sultry"
I loveeeee this line of lip colors so much! 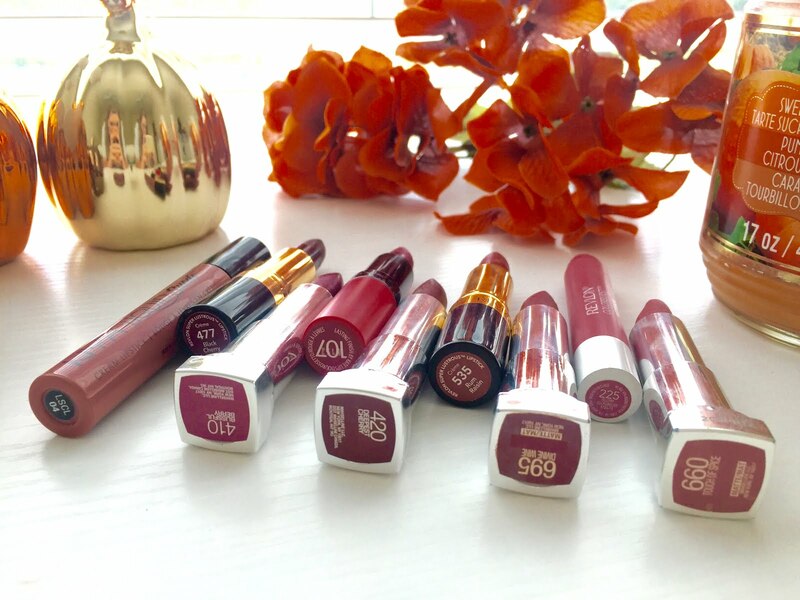 Chubby stick lip colors are so fun and easy to apply, and these particular ones are so creamy and apply like a dream while still being very pigmented and long lasting. This shade is a pink toned mauve that has been a staple for me for quite some time. If you can't tell, I am slightly obsessed with mauve toned lipsticks. 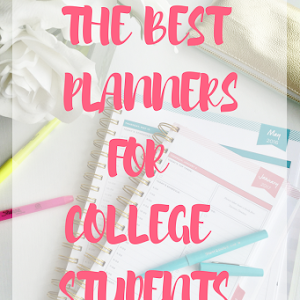 They are perfect for every day! 9. Maybelline Color Sensational Creamy Matter Lipcolor in "Touch of Spice"
Last but not least, this Pinterest find is a stunning shade that has a name that screams fall. It is a pink toned mauve that is almost identical to Revlon's "Sultry" (lipstick #8). The only difference is that Sultry shows up as quite a bit more pink in tone on the lips while Touch of Spice is a warmer, spicier shade with a bit more depth. Both lipsticks can pass as a dupe for Mac's infamous Twig lipstick. The finish is also completely matte. 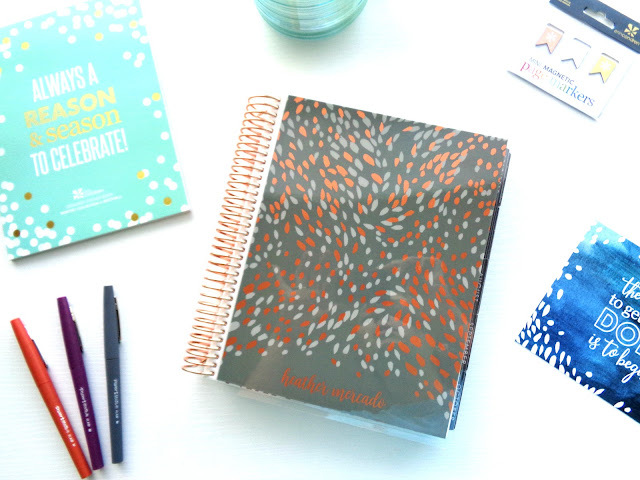 I just love this time of year, and I am feeling so inspired to create some great fall related content for this blog. Now, I'm going to go put some cozy socks on, light a candle, and listen to a fall playlist while working on some homework. Thanks for reading! I love deep/dark reds for fall (who am I kidding I love them all year long), but I love the ones you have here! I think the Touch of Spice looks so pretty and I have a few of maybeline's already so that will be the next one I play around with in the drugstore! Great picks! I love mauves! Is it bad if I buy every single one of these? 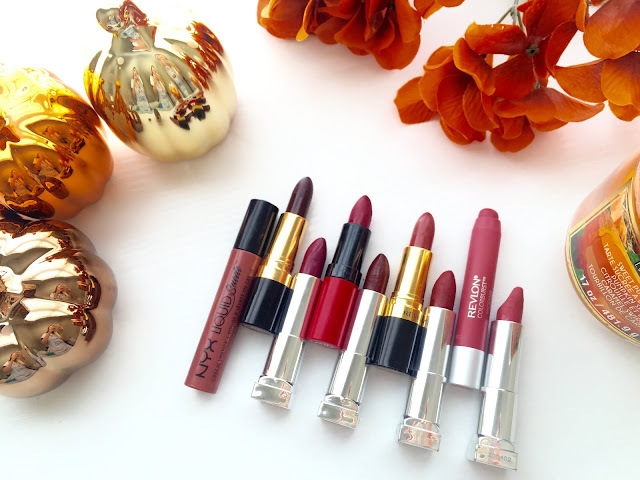 These shades are all perfect for fall! If you could only buy one of them which would it be? 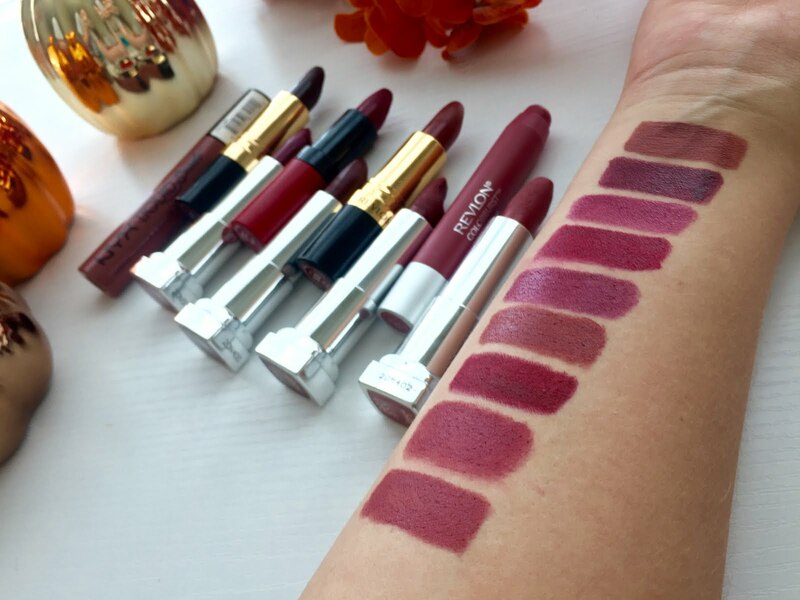 Love all of the burgundy shades! The revlon colorbust one looks pretty.. I've been looking for a good dark red. What's your favorite for super pale skin? I love these shades! I want to try the Rimmel 107 . It's a nice deep pink for fall. Oooooh all these colors are so pretty! I love wearing berry tones for fall, so I've repurchased several of the same shades from Maybelline (or similar colors) year after year! They're just so fun to experiment with! These are all GORGEOUS! 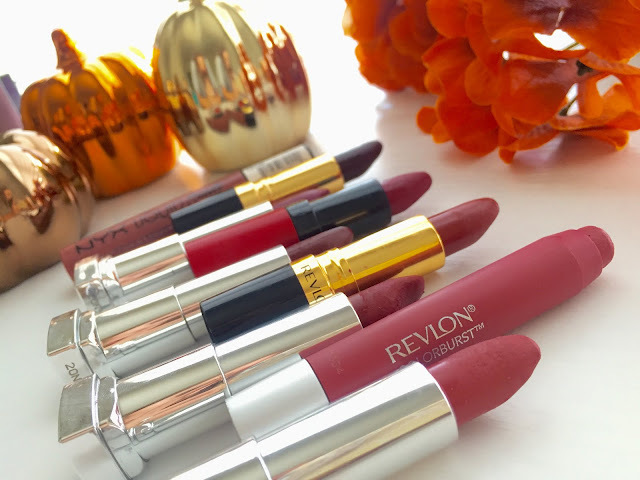 My favorite lip colors for fall are the Revlon Just Bitten Balm Stains - super easy to wear, and not too drying. But I do love the Maybelline Color Sensational lipsticks too, so Touch of Spice and Blissful Berry might be on my list... Thanks for sharing! Makes me SO excited for Fall. I've been finally for the first time experimenting with lip colors, and darker fall shades have so far been my favorite, so this post is absolutely perfect timing! Can't wait to try some of these out! I want Soft Spoken and Black Cherry so badly. I love gorgeous fall colors, for eyes and lips. My TGIF totally stands for Fall! Now I just need to learn to eat with lipstick on and not look like a clown after and we'll be good to go xD. Pinning this! I need to start wearing makeup more often, I am so lazy! Absolutely love the colors, perfect for fall! !